What's the best date you've ever been on? If you say dinner and a movie than it's time you were inspired by Aladdin and Jasmine, Disney's most adventurous couple. Sure, you might argue that other characters have been through more but with the aid of a flying carpet this couple saw a good third of the world in just one night and that was just their first date! Once this princess launched over that wall she proved to us that she wasn't the typical princess. Yeah, she might not know a lot about the real world. She gets nabbed immediately for taking an apple without realizing that you've got to pay for food in Agrabah. She wises up pretty quickly and by the end of her first day outside the palace walls, she's using some sweet parkour moves to jump from building to building. It's lucky that she's up for thinking on her feet because it's not long at all until she's on one of the craziest first dates of all time. Imagine the guts it takes to float on a rug without any kind of seat belt a thousand feet up in the air. That's a lot of magic to depend on when your life is in the tasseled hands of a rug. Of course, anyone who rocks a turquoise jumpsuit like Jasmine does would be pretty daring. 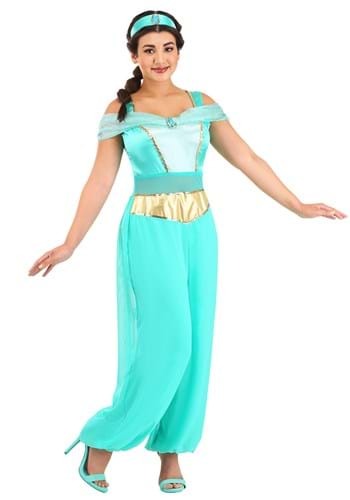 When you're dressing up for your next costumed event, channel some bravery and no-nonsense attitude into your personality when you dress up as Jasmine. You might want to keep your pet Tiger back home but we do have some great Aladdin costumes available if you're interested in doing a flying carpet reenactment. Talk about the best live action date ever!